Civilization ‘helps’ answer the question, “Who am I”? The cultural story we hear from infancy drums into us who we are and who we should be. Essentially, this is a form of ‘natural’ brainwashing — ‘natural’ in that the brainwashers are themselves brainwashed. Because the story is essentially arbitrary, we spend our lives striving to find our proper role. How well each of us succeeds probably affects our mental health a great deal. Now, contrast this cultural-narrative induced self-identity with the ancestral old way that existed prior to the agricultural revolution. In hunter-gatherer times, people gathered a natural and deeper sense of who they were through a life-long coexistence with their tribe mates. That intimate experience silently and intuitively instilled a sense of self from infancy onward. 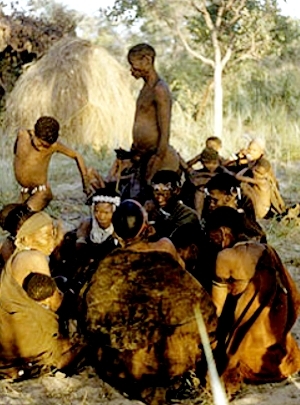 Tribe mates among the Bushmen hunter-gathers of the Kalahari exemplified this up until the middle of the last century. The Marshall family, (See Lorna Marshall) lived among and wrote about the previously unstudied !Kung people of the Kalahari Desert beginning in 1950. This excerpt from daughter Elizabeth Marshall’s book, The old way: a story of the first people, puts it succinctly. I believe that the importance of the group showed clearly in the way that the people made decisions. Women were as much a part of this as men. The people would talk together, for days if necessary, until every point of view had been considered. Our notions of secret ballots and majority rule would have seemed unpleasant to them—they preferred consensus, with everyone knowing the thoughts and feelings of everyone else, and everyone pleased with the decision. Our notions of individuality would also have seemed inappropriate to the Ju/wasi—they expected to function as group members. The sense of who we are as civilized people is largely based on various ideals — stories. These cultural narratives tout archetypical characteristics that citizens are encouraged to model. These encompass religion, politics, sports, dress, diet, music, history, etiquette, morals, taboos, etc. Which aspects, and how fervently individuals embrace them, depends upon personality and upbringing, among other factors. Naturally, some of this was also true of people living the old way... at least ever since humans developed their specialized cognitive ability, beginning perhaps some 100,000+ years ago (2). Nevertheless, the tribal experience offered its people a deeply natural means of acquiring a secure sense of self. The disconnection from tribal identity required for civilization to function efficiently rules much of that out. This isn’t surprisingly as in life every benefit comes with a cost! I have droned on plenty about how our attempt to maximize comfort and security comes with unintended consequences. However, Lorna Marshall put the order correctly — security and comfort. Security truly does come before everything. That’s survival. Comfort is just icing on that cake. I’ve long maintained that the root purpose of civilization, its raison d’être, has always been to maximize both of these, but security most of all. Life is precarious affair. All living things face a parade of changing circumstances. ‘Higher’ life forms have evolved nervous systems to detect such changes moment-to-moment, and respond fittingly. A visceral sense of apprehension and wariness, or fear (3) as I call it, keeps animals ultra-sensitive to the unknown and potentially lethal phenomenon. Naturally, this is much more noticeable in wild animals than domesticated ones, like our pets, our livestock, and us. Civilization and its ancillary domestication offer us, and the animals we’ve tamed, a safer and more comfortable world — overall. That is its promise, and without question, civilization has fulfilled that promise on the material level. However, the benefit comes with a cost. The tradeoff here is the loss of a deeper sense of security and comfort that the ‘uncivilized’ hunter-gather !Kung people of the Kalahari enjoyed. That is a trick question. Obviously, nothing should be done about this, nor could we even if we wanted to. More to the point, who would be willing or even able to give up the material benefits civilization offers? The survival instinct tugs away constantly on us to optimize our own comfort and security. Like any benefit generally, ‘more is better’ is what our biology tells us. What can withstand the insistence of this instinct? With desire choosing anything, of doing I see no satisfied end. All under heaven is divine capacity; nothing must be done either. In the external world of man, someone leads, someone follows.
. . . and the safe behind. With our wishes for improvement running most every facet of life, I assume chapter 29 is not music to many ears. Indeed, there have been many attempts throughout history to turn the civilization clock back; naturally, all fail. Aren’t the Islamic fanatics attempting that now, in a fashion similar to the Inquisition? We attempt to solve the inherent problems civilization creates by either turning the clock back or pushing for an idealized progressive future. For the progressive side of this coin, communism comes to mind. It is the classic Conservative vs. Liberal battle of ideologies… a vicious circle! We admit we are powerless over [our ‘addiction’ to comfort and security] — that our lives have become unmanageable. Similar to any addiction, we constantly try to solve the problems inherent to civilization with more of the same. In steadfast denial, we think we can have our cake and eat it too. That won’t change until we are brave enough to take the first step. People are difficult to govern because they are too intelligent. Therefore, using intelligence to govern the country injures the country. Not using intelligence to govern the country blesses the country. Know these both and investigate their patterns. That is called profound moral character. Moral character, profound indeed, distant indeed! To the outside world, contrary indeed. Then, and only then, reaching great conformity. Taking the first step — “we admit we are powerless over…” — coincides with the first step of Buddha’s eight fold path — Right Comprehension. The reason we can’t admit we are powerless is because we are blinded by what we desire to see. If nothing else, Right Comprehension is seeing life as it is without the sugar coating of idealistic ‘positive thinking’. That’s a tall order, for what we need or fear to see, strongly influences how-and-what we think we are seeing. It’s a conundrum. For a more practical way to tackle all of this, Buddha’s Noble Truths is the best place I’ve found to look. For instance, his second truth links directly to the sense of who we civilized people are, and the cultural narratives we are encouraged to model. I’ve droned on long enough, so I’ll dig into that next time. In the meantime, see if you can find the causal linkage that I notice in the Second Truth. (2) For an ‘outside the box’ look on our cognitive ability, see “Counterbalancing I.Q.“, “Think what you believe? Believe what you think?“, and “The Story Trumps Truth“. (3) “What is fear? ” I know my terse, cut-to-the-bone use of the word fear often fails to elucidate the particular point I’m making at the time. Most people probably picture the word fear as an effect, as in flee in fear or fearful screaming. It helps instead to consider fear as a cause. Correlations can also help put the word fear (as I use it) into context. For example, fear correlates with: uncertainty ~ unknown ~ unknowable ~ hidden ~ shadows ~ dark ~ silent ~ empty ~ death ~ loss ~ nothing ~ void ~ insecurity ~ apprehension ~ wariness, etc. In other words, I use the word fear to sum up some dimensions of what is an inexplicable realm that haunts all living creatures as they strive to survive. this is awesome mr abbot.